Northern Kentucky Univesity Bachelors in Exercise Science/P.E. "If you have a strong heart, the rest of your body will follow." I believe that every individual is capable of creating something magnificent in themselves. It takes a ton of dedication to create a mind set of health and fitness. I will make sure my clients train and leave with the necessary tools to create a better "F.I.T. (Frequency, Intensity and Time) model" in their daily schedules. "In every person, their is a warrior" Finding your inner strength to get through your workouts is the biggest psychological struggle most people will ever face. I will do my best to make sure that every individual finds another level. A level of training that they have never experienced. You will become a "SPARTAN"! I use own stabilizing exercises, body weight resistance (isometric and ballistic training), plate and dumbbell training, sports performance technique, nutrition recommendations from R.D. (Registered Dieticians) and regeneration of muscle tissue (myofacial release techniques). Born in Lawrenceburg Indiana and raised in Aurora, Indiana, I have always been a competitive athlete. I played baseball, ran in mini races for kids, rode bikes with my mom, and enjoyed growing up on a farm. When I attended high school at South Dearborn High School in Aurora, IN. I became addicted to exercise. My mom had to work late and I didn't want to ride the bus, so I would stay late and lift weights and exercise after practices. I played football, basketball, and ran track in high school and realized the importance of working out on top of the sport. Eventually the school came up with Weight lifting classes and automatically signed up. I then decided to attend College at Northern Kentucky University. I started out as a Pre-med student and decided that was to much mind processing and not enough physical activity that my body craved. I switched majors and became very much involved with N.K.U. 's campus recreation. I was asked to create and plan the Personal Training at Campus Recreation as apart of my many college jobs. I was also a group exercise instructor and a Fitness Coach at the local YMCA in Aurora, IN. I finished on the Deans List with a Bachelors in Exercise Science. I met my wife while working at Mercy Hospital in Cincinnati, OH. I packed up all my things and moved to Indianapolis, IN. 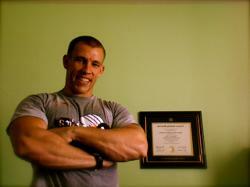 and began working at Lifetime Fitness as a Boot Camp Instructor and Certified Personal Trainer. I was then offered a position as Co-owners in my own company, S.P.A.R.T.A. We are located at: 11825 Technology Drive Fishers, IN. 46038 I will strive to do everything I can to make Indiana a healthier state and the community of Fishers a much more healthy place to live.